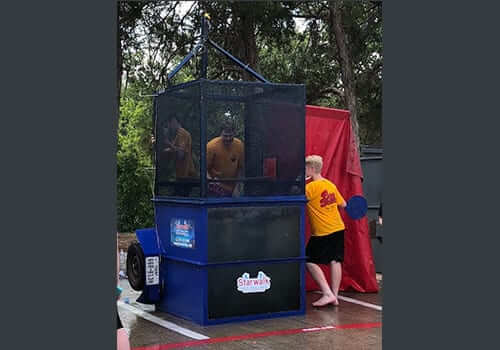 Enjoy the fun of a dunk tank rental and watching the face of your friends, teachers or co-workers as they fall into the water. Even though you can’t throw, this dunk booth rental item is easy to use. You can define the distance at which to throw the baseball or softball. In addition, our dunk tank has a clear plexiglass front to catch the look when the seat drops into the water. Thinking about a dunk tank for your corporate event, no problem. We can set it up in the parking lot in as little as 10 min. As long as you have a water source to fill the large tank, the fill process for the dunk tank takes about 45 minutes with a standard water hose. With our quick release valve, the water drains in about 10 min.